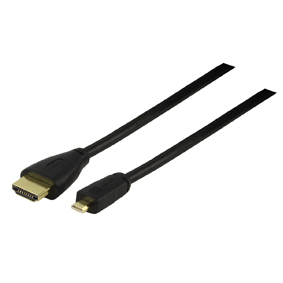 Tesco Hudle Compatible Micro HDMI To HDMI Cable 1.5m - Mini HDMI Cable - Micro HDMI Cables, Hdmi Cables Same Day Dispatch On Our Leads If You Order Before 2pm Weekdays. Ideal for Tesco Hudle 2, Amazon Kindle Fire HD (1st generation only) and Google Nexus 10 HD. The latest HIGH SPEED HDMI connection lead available. This cable is equipped with the smallest micro type D HDMI connection. Connect a small mobile device with a micro HDMI connection to your LCD or PLASMA TV and enjoy. This is not an extensive list, if your device is not listed but it uses Micro HDMI, the cable should work. The image below shows a Micro HDMI socket. See the link below for a video showing the different HDMI plug sizes. Currently viewing: Tesco Hudle Compatible Micro HDMI To HDMI Cable 1.5m - Mini HDMI Cable - Micro HDMI Cables, Hdmi Cables Same Day Dispatch On Our Leads If You Order Before 2pm Weekdays.